- All game highlight videos that we produce for the team during the season and the annual banquet video. 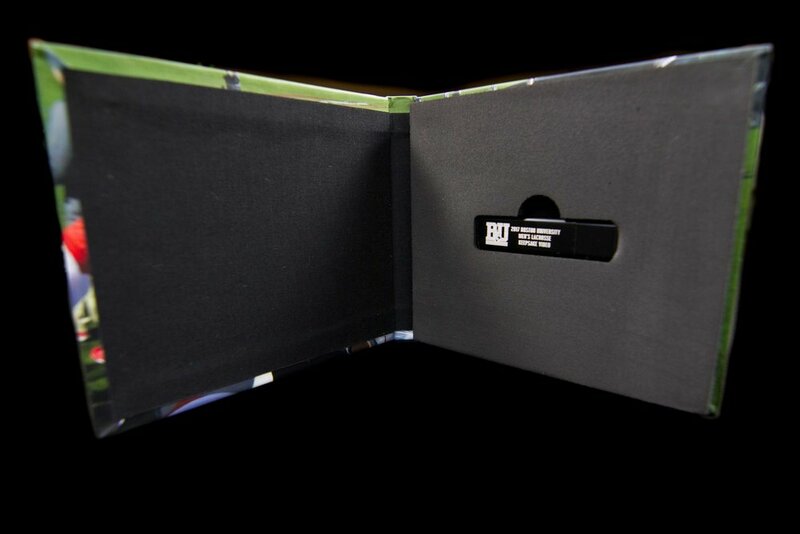 - Customized USB drive with all videos loaded onto the drive and packaged in a custom USB folio. A keepsake video is an ideal way to remember your Senior Season of lacrosse at Boston University! As with our athlete highlight video, we assemble clips from game play that we record during your Senior year and produce this 5-10 minute personalized highlight video. Music and graphics are included with this video that adds value for years to come. Q1.) Does the personalized highlight video feature all Seniors on the team or does it just feature the individual player. A1.) This video features the individual player with clips of that player from game footage that we film from both the elevated camera position and the field level camera position. Each Keepsake Video Highlight Package will include this personalized, individualized player highlight video. Please refer to the example video above. A2.) During the course of the season we will be publishing highlight videos from 4 or 5 specific games that we film at field level. We will also be producing an annual banquet video for the team. The game highlight videos along with the annual banquet video will be included in the Keepsake Video Highlight Package. A3.) We will be producing these videos following the completion of the season. It is our intention to have these Keepsake Video Highlight Packages completed and delivered by mid-June. We will need to work out the details with the team regarding the availability of the 2017 season banquet video as this video will be featured at the team's banquet in early 2018. If this video becomes available after the Keepsake Video Highlight Packages have been delivered to recipients, we will then post the banquet video online so that these folks can then download this video. Q4.) Can the athlete and/or parent of the athlete choose the music to use in the personalized highlight video? A4.) Yes, but it must be "clean" music. We will not produce a video that contains vulgar or inappropriate music. Thank you for submitting your Keepsake question. We will have an answer back to you shortly!